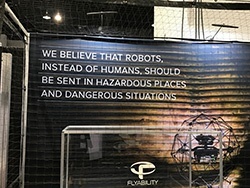 At a trade show that features the latest in the fast-developing field of unmanned technology, there is a lot of interest and noise. It’s the Wild West, and market leadership is up for grabs. So how do you make sure your company’s booth draws attention and traffic? Effective demos are key. Unique approaches to booth advertisement will get you noticed, too. We noticed a number of powerful tactics at XPONENTIAL 2017. The following tactics are just a few your team could apply to any large trade show strategy. We all have our favorite pair of shoes. They might be the ones that look great but don’t feel as great, the shoes that match everything, or the shoes that are surprisingly comfortable. We have favorites for work, going out—any number of occasions. But what about trade shows? CES, Photonics West, and other industry trade shows are just around the corner. Deciding how you will collect and manage leads is an important part of trade show planning, but the methods of lead capture vary. The most foolproof method of lead collection is using the official scanner provided at the event; however, due to the cost, many professionals are now relying on their phones to collect leads. Just be sure to test out any app you plan on using to work out any technical issues and make sure it will serve your needs. An Introvert's Point of View: How Do You Maximize Trade Show ROI When You're Not Exactly a Social Butterfly? Industry events such as trade shows and conferences are a great place to build sales opportunities and learn from fellow professionals. If you're a bold personality, it's easy to excel in these situations. However, if you’re a more introverted person, major events can feel daunting—speaking from personal experience. Occasionally we hear companies say that attending or exhibiting at trade shows brought them little ROI. The first question we ask is, “How many appointments with prospects did you have set up beforehand?” Frequently the answer is none. Hoping that prospects with a need will drop by your booth during the show, whether or not they are familiar with your company beforehand, is simply not enough. Booth design isn’t the only thing that can make or break a company’s trade show presence. Engaged, knowledgeable staff members who are eager to share their expertise are a must-have. A cool demo doesn’t hurt either. Check out the companies and events we thought shined at this year’s SPIE Photonics West, and what could have been better.